Tips & recommendations for replacing your gearcase lower unit. It happens – just plain bad luck – hitting an underwater tree stump, rock or other invisible debris & your lower unit is shot. After you get towed safely back to shore and have a chance to regroup, what are your next action steps? We have written this article to outline the step you should take if you damage your lower unit. 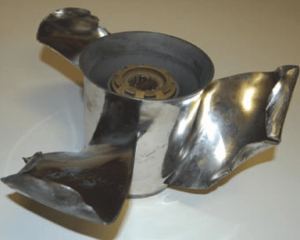 Use this as a reference tool as you navigate through the process of repairing or replacing your gearcase lower unit. gears may seem to work fine at first but over time the off-kilter gears will wear away and cause eventual failure. We recommend you have your motor diagnosed thoroughly to determine if you have internal damage. Check out this forum for further evidence: What smacking a boulder does to your lower unit gears. We recommend calling the insurance company that has your boat policy before you do anything. Some policies will cover accidental damage to your drive. If your insurance policy covers the damage, your claims adjuster will give you instructions as to how to get your lower unit fixed or replaced. Some insurance companies tell you where to go for a replacement unit or repairs. Others will approve your repair/replacement estimate at the shop of your choice. Either way, be sure you have a reputable boat repair shop that specializes in lower units. Your local boat shop may purchase a replacement lower unit from a 3rd party for you so do your homework and find out where the unit is coming from. Three options for replacing your unit are discussed below. The choices you have when replacing a lower unit include a brand-new OEM unit, a remanufactured OEM unit or a new aftermarket unit. I will discuss the pros and cons of each below. This unit is made by your motor manufacturer and will contain original OEM parts. Quality manufacturing is a guarantee and the unit will come with a nice warranty. Warranties will vary by manufacturer so please check with a knowledgeable dealer regarding the warranty. The new aftermarket lower unit is usually manufactured in China. The quality control is generally lacking on these units. The up side is that they are significantly cheaper and some aftermarket manufacturers give a great, 3 year, fault free warranty. While this warranty is nice, it is a pain in the neck to deal with replacing the unit under warranty. There is the obvious down time associated with diagnosing the problem, calling the manufacturer for warranty replacement, placing a replacement order, waiting for the unit to be delivered then waiting on the boat shop to install the unit. Do your homework before purchasing an aftermarket unit! A rebuilt or remanufactured unit should be built by quality, trained mechanics with OEM parts. These units offer the best of both worlds, giving you OEM parts, a unit assembled by trained mechanics in the US and a nice price savings over new OEM units. This option is the preferred choice of most boaters. 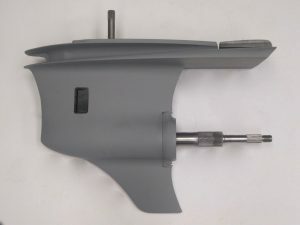 If you are looking for a reputable remanufacture of lower units, check us out: US Boatworks in Kansas City. We have been in the Replacement Drive business for over 30 years and know your motor inside and out. We offer personalized service and will get your unit to you with the exact specifications needed. Insurance claims are always welcome. Our owner personally handles all insurance claims and is happy to talk with you and your adjuster to get the best deal for you. Call us at 913-342-0011 or email us for more info.